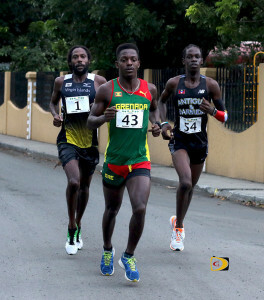 Grenada’s Renon Radix, center, USVI’s Shane DeGannes, left and Antigua and Barbuda’s Kalique St. Jean, battling at the 10-miles mark, making it the most competitive race in its 11-year history. It wasn’t the fastest, but definitely the most competitive race in the the 11-year history of the Delioite-Ogier BVI Sunrise Half Marathon, that ended with St. Thomas’ Ruth Ann David improving her own course record on Saturday. The men’s pace was set by Grenada’s Renon Radix, Antigua and Barbuda’s Kalique St. Jean and the USVI’s Shane DeGannes, a 3-peat champion who was second last year, battling over the first 10½ miles, before DeGannes was dropped. Radix and St. Jean dueled for anther mile before Radix went clear for the victory. In the women’s race, St. Thomas’ David and Grenada’s Kinesha Pascal engaged in a duel before the defending champ pulled away to finish sixth overall. Rawlinson & Hunter/Ogier, (Rebecca Clark, Clifton Struiken, Derek Rawlins), 1:44:27. Runs & Poses – KPMG 1, (Jacques Roux , Lovat Carnelly, Steve Langford), 1:51:35. BDO (Krystal Blackman, Guyp DuBois, Ryan Geluk), 1:56:51. Harneys 3 (Jonathan Addo, Stuart Cullen, Tate Gotosa) 2:11:58. Deloitte (Natasha Rusheinski, Aurelie LeGangneux, Martin Perez), 2:27:40. Baker Tilly (Laurent Keeble-Buckle, Hadley Chilton, Kara McCracken), 2:32:56. Harneys 2 (Rahel Worde, Nadine Joseph, Joanna Hossack), 2:54:35.13. JulesSmith (Chris Smith, Julianne Potgieter), 1:45:24. Brute Squad (Paul and Anjali Mellor) 1:48:42. Tek Dat (Julien Johnson, Adenike Secard, Marvin Flax) 2:08:58. The end of the Boks (Johnnie Bailey, Cayley Smit) 2:15:36. Big Mac (Nylross Jalova, Ravenal Santos, Mitchelle Fos) 2:25:50. Tap it and Run (Ryan Wendt, Odalis Peña) 3:03:41. Best Water stop – Claire “Turn Point” Burke, Honourable Mentions: Ogier (Music), Sensus (Toga Party), Deloitte (electrolytes! )/VISAR.